Do you go in to work with the intentions of being productive only to find yourself becoming easily distracted, leaving you feeling defeated at the end of the day? With only so many hours available to complete your assignments, it’s necessary to make the most of your time. 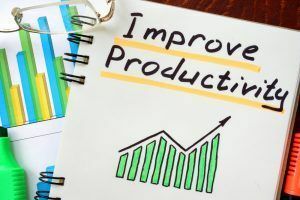 Although it does take more of an effort to manage your time wisely, increasing your productivity at work is possible by following these four steps. Tracking the amount of time you spend on completing each task allows you to see where you could make improvements to be more productive. It also helps you to answer the question, “Why do I only have this much work done in this amount of time?” If you notice that you are spending too many hours on one assignment, limit what’s distracting you or make it a point to finish each assignment within a reasonable time. Working on multiple tasks at the same time may seem efficient, but doing too many things at once can actually cause you to lose time and productivity. Try completing one task entirely before moving on to the next one. Like most, you have a lot of demands for your time, but whenever possible, eliminate all distractions and concentrate on what you’re doing at the moment. Even brief interruptions can add up and cause you to get off track. Whether it’s your boss dropping off papers on your desk, your phone ringing, email notifications popping up, or your co-worker chatting you up in the hallway – it’s easy to become distracted. While you can’t stop every interruption from happening, you can be proactive by minimizing some. Turn off notifications on your computer and phone, close programs you’re not using at the moment, or work at times when there are not so many disturbances. While it may take some time to change your working habits, incorporating these methods into your workday will help you improve your overall productivity. If you’ve tried different things to help you focus, but still find yourself stuck in your current job role, maybe it’s time to try something new. Get the specialized training you need to start a new career by completing our LifeWorks training course. For more information on how you can begin getting exclusive student benefits, apply now or call us at 407-641-0755.